UPDATE: Samsung launches Galaxy S III Mini with smaller 4in screen, out Nov 8 | What Hi-Fi? It's official, Samsung has confirmed this morning that its new Galaxy S III Mini smartphone will be available in the UK from November 8th with free content, including The Sims 3 and Bejewelled 2. In addition, the Samsung Galaxy S III Mini gives owners access to the Samsung Video and Games Hub, as well as a 50GB Dropbox which is free for two years. 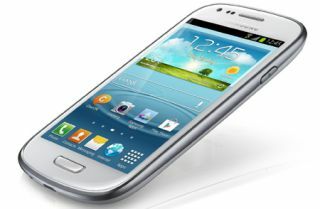 Samsung has announced the Galaxy S III Mini smartphone, a smaller version of its hugely popular Galaxy S III phone. The S III Mini sports a 4in Super AMOLED screen compared to the S III's 4.8in display, with a lower 800 x 480 resolution. The Mini is powered by Android 4.1 (Jelly Bean), has a dual core 1GHz processor, a 5MP front camera, Bluetooth and NFC. Plenty of other features from the S III, including S Voice, which is Samsung's answer to Apple's Siri, and Smart Stay, which keeps the screen on as long as you're looking at it. S Beam is also supported, allowing transfer of files between S Beam compatible devices simply by touching them together. Measuring 121.55mm tall (to be exact) by 63mm wide and 9.85mm thick, the Galaxy S III Mini weighs just 111.5g. The S III by comparison is 136.6 x 70.6 x 8.6mm, and weighs 133g. Details on a release date of the Samsung Galaxy S III Mini have yet to be confirmed but retail site Clove has priced the Galaxy S III Mini phone up at £300 (spotted by Slashgear).